* Made using a size K (6.50 MM) hook and Red Heart Super Saver Yarn. Rnd 3: Jn with a sl st between one of the clusters. Ch 2, 2 dc in same space. 3 dc in each space around except in the two armholes. Work 5 dc in each armhole. Jn with a sl st in first dc. Rnds 5 and 6: Jn with a sl st between one of the clusters. Ch 2, dc in same st, 3 dc in each space between the fan clusters around. Jn with a sl st in first dc. Now will begin working back and forth in rows instead of around. Row 2: Jn with a sl st in the last sc of previous row. Ch 1, turn. sc in next st (not the same st as your ch-1, but the hdc from the previous row), hdc in the next st, ch 1, 3 dc in the second space between fan stitches rather than the space that is now directly below your hdc. 3 dc in each space across stopping before last space.Ch 1, hdc in 3rd st from end, sc in 2nd st from end, sl st in the last st of the row. Fasten off. 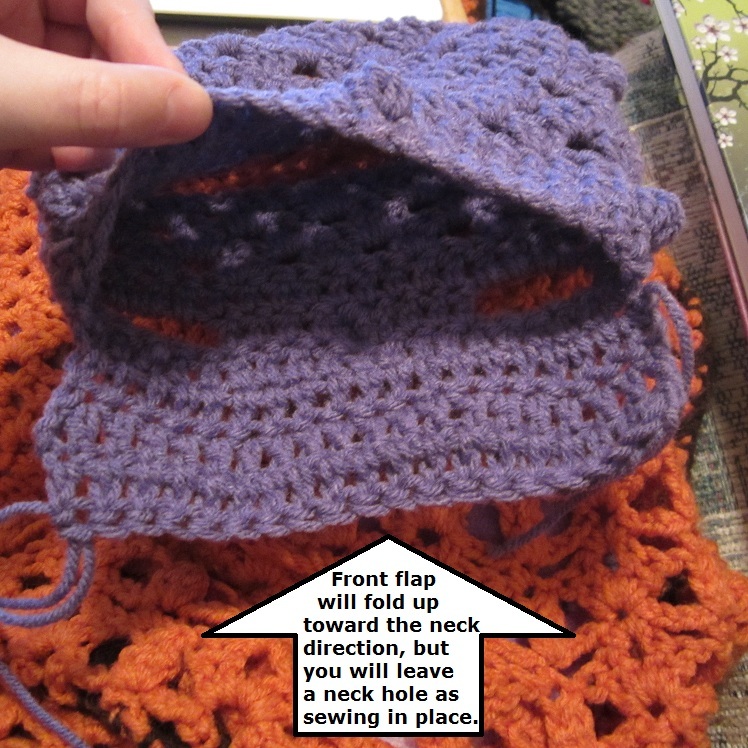 Row 3: You don’t have to turn rows anymore unless you’re using the same color and working back and forth. If you’re changing colors you might as well keep working with the right side facing you on every row now. Jn with a sl st in 1st st. (This should be between the sc/sl st spot of previous row.) Ch 1, (sc, hdc, dc) in same st, 3 dc in every space between fans across. After the last fan, sk the next st and in the very last st of the row (this should be between the sc/sl st of previous row) work (dc, hdc, sc, ch 1, sl st) in that last st.
Row 4 -7: Repeat Row 2 and 3 twice. Row 8: Repeat Row 2. Front Section: (Basically this will fill in the bottom half of the front of the sweater. )Working with the original chain you made to begin the sweater, you’ll join with a sl st along the bottom section of the front just in line with the outside of one of the legs like you did on the other side of the sweater to create the back and forth rows of the sweater’s back. Then you’ll work across until you reach even with the outside of the opposite leg hole. You’ll be turning and working back and forth, and as you move up the rows it will make a kind of square which you’ll then fold up toward the neck/chest and sew it in place leaving only the opening for the neck. Row 1: Jn with a sl st in the original chain just in line with the outside of one of the leg holes. You’ll be joining in one of the spaces between the fans, only from the angel of the chain along the bottom and working in the opposite direction. Ch 2, dc only once in the same space, 3 dc in each space between the fans until you reach the fan space that is even with the outside of the second leg hole. Work only 2 dc in that last space. Row 2: Jn with a sl st in the first st of the row. Ch 2, 3 dc in each space between the fans across. Work one dc in very last st.
Row 3: Jn with a sl st in first st. Ch 2, dc only once in the same space, 3 dc in each space between the fan across. Then work 2 dc in the very last space. Fasten off after row 3. 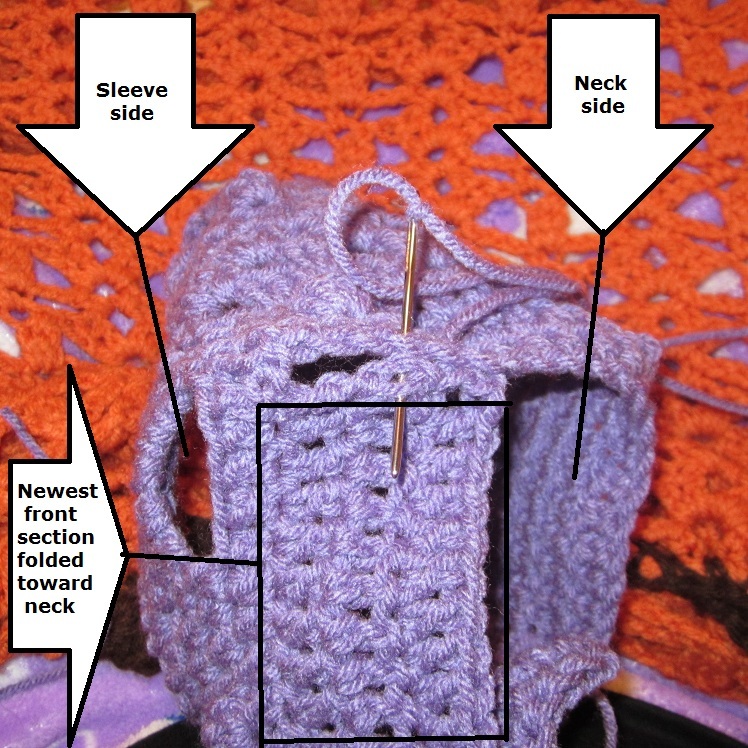 Fold the square section to fit along the bottom section of the front of the sweater. Use a yarn needle and pick a suitable color yarn to sew this flap section into place along the chain at the sides leaving only the neck hole at the top where you’ll then be able to work around to form a colar or turtleneck. If you’d like to give the shoulders/chest a more rounded appearance you can get fancy and turn the sweater in-side-out to sew this flap into place, but I usually don’t notice much of a difference is sewing it in place right-side-out or in-side-out. 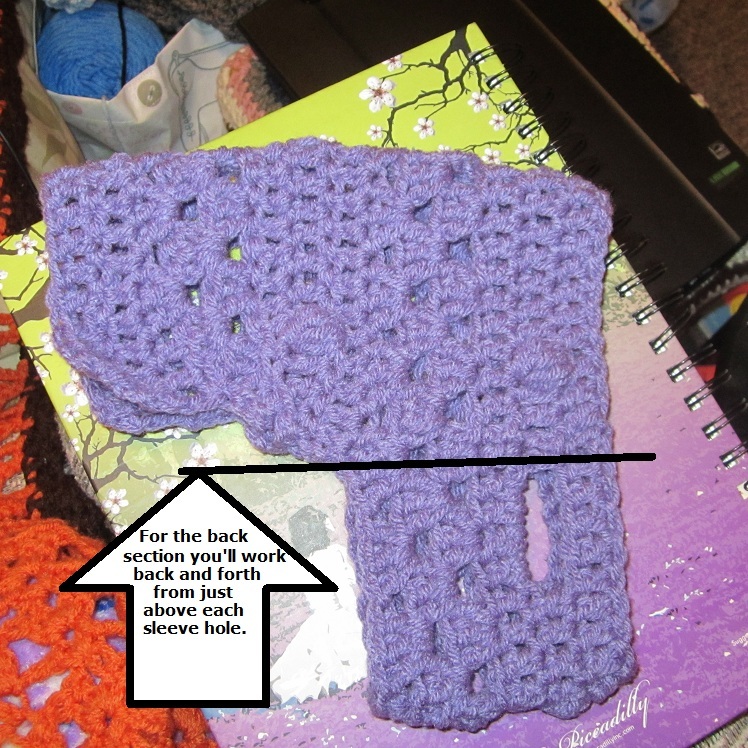 Rnd 1: Around each armhole, there should be about 5 spaces that are like the spaces between the 3-dc-fans. Jn with a sl st in one of these spaces, ch 2, 2 dc in same space as join, then you’ll put 3 dc in each space around accept for the little span of 5 dc in a row where you need to pick a spot about mid-way bewteen those stitches and add one more set of 3 dc in one st. This should give you 6 even 3-dc-fans to form the shape of the sleeve, and you’ll join with a sl st in top of the first dc/ch-2. Then make the sleeves as long as you’d like by joining next rnd with a sl st in any space between the fans, ch 2, dc in same space, then 3 dc in each space around and jn with a sl st in top of first dc/ch-2. I usually just add 2 rows, but you might be in the mood some time for some long pet sleeves! Fasten off at the end of your last row and weave in ends. Rnd 1 and 2: Jn with sl st in any of the open spaces along the neck. Ch 2, 2dc in same space, 3 dc in next space and in each space around. Jn with a sl st in top of first dc. 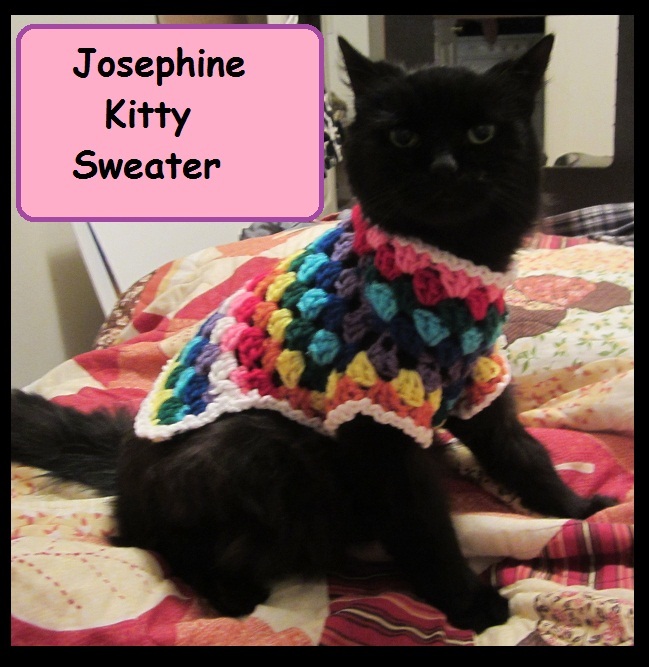 This entry was posted in Uncategorized and tagged bible story, biblical inspired, cat, clothing, crochet, dog, doggie, free, Free Pattern, joseph coat, josephine, kitty, meow, pattern, pet, pets, sweater. Bookmark the permalink. 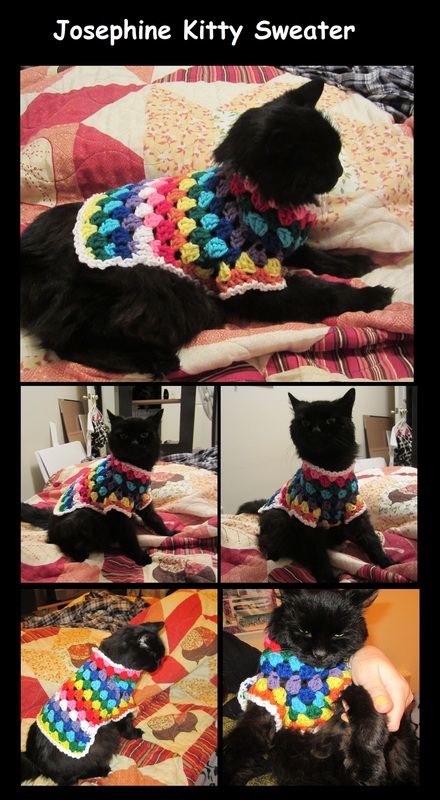 I’ve been looking for crochet kitty sweaters EVERYWHERE! Thank goodness I came upon this one by chance! 🙂 It’s an adorable pattern. Thank you! 🙂 I’m glad you like it! My kitty puts up with modeling them like a lil’ dream kitty! She’s so good to me!